MORE than 130 dealer representatives attended MG Motor UK’s annual Dealer Conference and Dealer of the Year Awards in Birmingham – where they were treated to the official unveiling of the iconic British brand’s first battery electric car. The MG ZS EV is set to launch in September 2019, and attendees also heard about ‘Momentum & Growth’ – MG’s mid-term sales plan that aims to treble its sales volumes over the coming years. MG used the conference as well to announce the launch of its aftersales customer retention programme to generate increased service profitability through the rapidly growing MG parc. The highlight of the event was the gala dinner, which included the 2018 Dealer of the Year Awards. More than 20 MG dealerships and their staff were recognised for their outstanding performance during 2018. 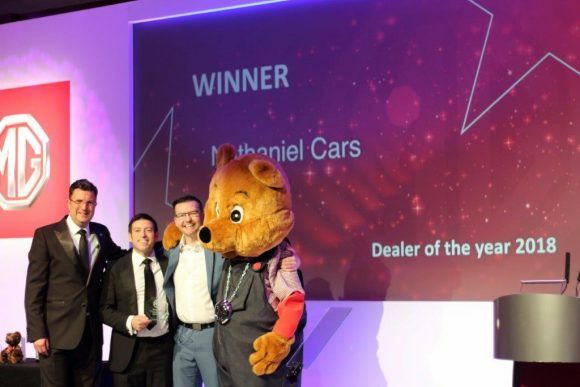 Nathaniel Cars took the overall accolade for Dealer of the Year, while runners-up gongs went to Eric Stead, WH Brand and Apple MG.
Daniel Gregorious, head of sales and marketing at MG, said ‘After an incredible 2018, during which we doubled our sales volume, it was a huge privilege to recognise the dealerships and people who made it possible.